This post is the third of six in a series with ideas and resources on how to make computing lessons engaging and demanding for as many students as possible. Click here for the original post. Some people love group work, some people loathe it. Collaboration doesn’t have to mean working in pairs or small groups. Any form of guided interaction between students – online / face to face / written / email – comes with its own challenges but also potential to boost learning and understanding. The collaboration doesn’t have to be between students either: it’s a great way to involve parents, grand-parents, neighbours or foreign exchange students if you choose your opportunities and platforms for collaboration carefully. Too much collaboration and a lesson can descend into chaos. A short, focused and well managed collaborative activity though can boost the overall learning and progress well beyond the sum of the individual parts. Set a homework for students to explain a concept to a relative or neighbour who’s rubbish with technology. Try silent group work where all communication takes place via email / forum / shared folder / whatever. Set up a questions & answers forum / shared document and ask students to nominate the person who has been most helpful on it at the end of a lesson where it’s used. Who is too dependent on me as their teacher? Who is to proud or afraid to ask anyone for help? The group will have to present their recommendations and answer questions from the rest of the class. 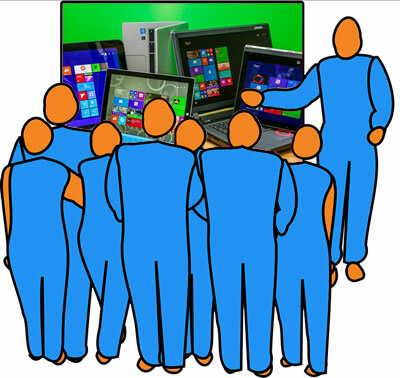 Each person in the group must say something and have contributed something to whatever you choose to display on the projector screen during the presentation. This paper recommends a “Trio of best practice” for reducing the number of students who drop out from a computing course (at the University of California). Two of their three recommended strategies involve collaboration between students: peer instruction and pair programming.